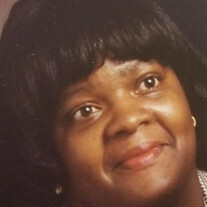 Emma (Kelly) Quick, 66, of Springfield, Ohio went home to be with the Lord on Sunday, October 28, 2018 at Miami Valley Hospital, Dayton, Ohio. Emma was born May 3, 1952 in Dayton, Ohio . She was the owner of Mincie's Jewelry and a 1971 graduate of Dunbar High School. Emma was an awesome wife, mother and loving person. Before taking ill, her favorite pastime was watching golf, giving to whoever was in need, selling merchandise and caring for those who were less fortunate. She gave of herself and her home by being a foster parent. The amount she has given over the time of her life cannot be measured in regard to what she gave to her family and friends. She is preceded in death by her parents, Oscar and Eunice (Sayles) Kelly Sr.;husband, Ernest Quick Jr.; brother, Joseph Hall and sister, Gladys Kelly. She leaves to cherish her memory her children, Dorsey F. Marable of Dayton, Ohio, Natasha (Kofi) Pratt of Waldorf, Maryland, William L. (Michelle) Taylor, of Springfield, Ohio, Thomas Quick of Dayton, Ohio and Emanuel (Nikki) Bibbs of Springfield, Ohio; three brothers, Oscar (Marie) Kelly of Washington, Henry and Luther Kelly of Dayton, Ohio; two sisters, Jennie "Peaches" Arnold and Shirley Sims of Dayton, Ohio, 16 grandchildren and a host of other relatives and friends.